The Secrets of Castor Oil For Hair Growth - Get Thick & Lucscious Hair! Read more about the 18 practical uses of castor oil as passed down by old folks. 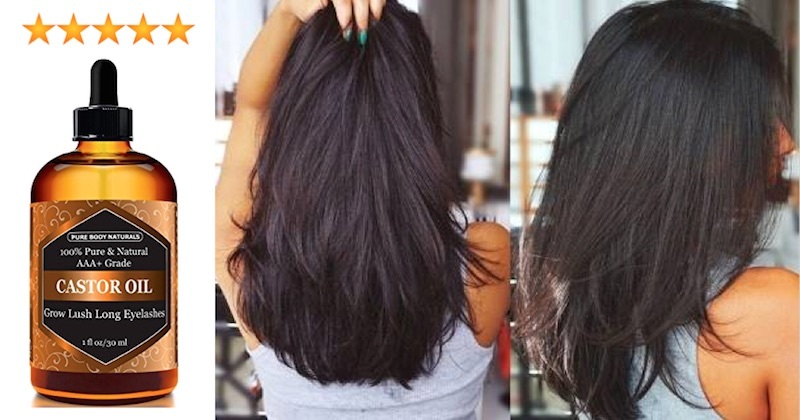 Thickens and regrows hair: Castor oil is loaded with omega 9 fatty acids, which nourish the hair and follicles. Castor oil is able to penetrate into the pores and follicles that produce hair. Split ends: Rubbing castor oil gently onto the ends of your hair and leaving it there for one or more hours can heal split ends. Leave it in for one hour and then shampoo as normal. Long lashes: Eyelashes deserve to look gorgeous, too! Before going to sleep, carefully use a Q-tip to dab castor oil onto your eyelids. Dandruff: Dandruff is an embarrassing problem, and who wants to use those anti-dandruff shampoos forever? Mix castor oil with lemon juice and olive oil. Apply it to your scalp and leave it on for one hour before shampooing as normal. Castor oil has a very thick and sticky consistency that can get messy when applied to your hair. Here’s an easy way to apply castor oil on your hair without the mess and still be able to grow a thick mop of hair. Castor oil not only prevents excessive hair loss, it also helps grow stronger hair that doesn’t fall out easily. It has antibacterial and antifungal properties that treat the scalp and increase circulation to the scalp to improve or stimulate hair growth. When castor oil is applied regularly, it can also undo some of the damage done by harsh chemical hair products. The antioxidants in castor oil supports keratin in hair, making it stronger, smoother and less frizzy. It is important to use only organic, cold-pressed castor oil that is hexane-free. Many low-quality castor oil products are extracted using a solvent called hexane, that can be harmful when used regularly. It is best if the oil came in dark bottles as oils have a tendency to turn rancid faster with exposure to light. I like this castor oil that comes with an applicator kit, that makes it easy to use. The kit includes applicators for eyebrows and eyelashes. There is also a dropper in the bottle. I have seen good results by using castor oil only 2 or 3 times a week. I like to apply it just the day before my hairwash to let it do its work. Applying daily doesn’t make it work any better, and besides it just makes your hair oily and greasy. For maximum benefit, I massage the oil into the scalp and leave it for at least one hour. First of all, prepare your castor oil. Castor oil is very thick and sticky, so you can add another hair oil to make it easier to apply. You can use argan oil, jojoba oil or coconut oil. Use equal parts castor oil and the oil of your choice. 1 tablespoon of each should be good. Use more for long hair. Mix the oils in a small bowl. Place the small bowl of oil in a bigger bowl of hot water to warm it up for easy application. Spray water on your hair to dampen it (not wet). Dip the tip of your fingers into the warm oil and massage into your scalp. Do this till your scalp is covered with the oil. With the balance of the oil, rub it between your palms and run it through your hair. Cover your hair with a disposable shower cap, then wrap a hot towel around your head and the shower cap to warm up the scalp so that it is able to absorb the nutrients through the pores. Leave it for at least one hour. Washing off the castor oil from your hair can be a little tricky. An easy way is to massage a generous amount of conditioner into your scalp to remove the castor oil. Rinse it and then shampoo as usual. Then, use conditioner again and rinse. Most people see an improvement only after a few washes. You will notice that you have less hair drop when you wash and blow your hair. Let us know how it works for you!